On Saturday June 21st at the Worcester Guildhall there will be an Authors’ Fair between 11:00 & 16:00. A showcase of writing talent from across the region in the heart of Worcester. Entry is free. Up to 25 local authors will be displaying their work and short performances will take place on the stage throughout the day. Copies of ‘Portraits of Prose’ will be available to buy from ‘Black Pear Press’. 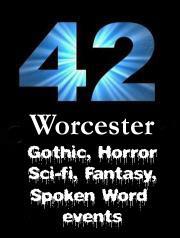 On Wednesday June 25th at Drummonds in New Street, Andrew Owens will be hosting the ’42 Worcester Litfest Special’. This year’s special will feature Lou Morgan. 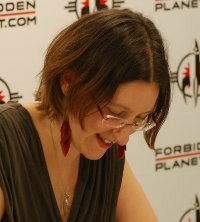 Her first novel, “Blood and Feathers” – an urban fantasy described as ‘Alice in Wonderland goes to Hell’ – was published in the UK & the US by Solaris Books in August 2012, with a sequel, “Blood and Feathers: Rebellion” released in the summer of 2013. On Thursday June 26th at the Old Rectifying House, Andrew Owens will be performing at the ‘SpeakEasy Litfest Special’.